I talked about Dark Sky in March, so you can read more about MY thoughts on the subject there, but I wanted to share this article, too. Bob Parks of the International Dark-Sky Association said, "One good rule of thumb is that if you can see the bulb, then there's too much glare." We aren't stocking them just yet ~ the technology is changing so fast, we're afraid as soon as we stock an LED product, it'll get improved and changed and then we'll be stuck with the old stuff! But Halo has it all in stock, and they ship really quickly, so for now at least, we'll order them for you as needed. But you really should come see them ~ we think they've done the best job with trims and diodes and brightness and color. 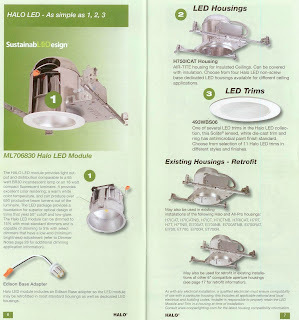 And we DO still stock and display the Cree/LLF LED recessed, which were the first GOOD product on the market!